South America. Four desperate men. A truck full of nitrogylcerine. A raw, white-knuckle thriller from Henri-Georges Clouzot gets the Blu-Ray treatment from Criterion, in what is easily one of 2009's best releases. American audiences are likely more familiar with William Friedkin's 1977 Sorcerer than this 1953 classic from the great Henri-Georges Clouzot (Les Diaboliques), both of which are based on Georges Arnaud's novel Le salaire de la peur about four desperate souls who have to drive two trucks filled with nitroglycerin through the bumpy roads of the South American jungle. And it's really through no fault of our collective own, either. With a hefty running time of nearly 2 1/2 hours, Clouzot's film was notoriously chopped by 50 minutes when released stateside in 1955, with censors slicing and dicing what was percieved as anti-Americanism and implied homosexuality, and in the subsequent decades it was extremely difficult to see this white-knuckle drama in its full, uncut splendor. At least until Criterion stepped up in 2005, with the original uncut 147-minute version. It's an almost barebones tale, told by Clouzot in what at first seems like a leisurely manner, as it takes a fair amount of time to fully establish the level of desperation in the oddball gaggle of misfits shuffling around the hot and dusty South American oil town of Las Piedras. The townsfolk may be destitute�living as they are in the shadow of a big, cold-hearted American oil company�but they love a good drink, and assorted expatriated types like Mario (Yves Montand) get enough work to keep them in liquor and food, spending their days in a scruffy cantina, constantly trying to figure what it will take to get the money to get the hell out for good. A golden opportunity arises�more of a suicide mission�when the oil company suddenly needs four drivers to transport two trucks loaded with nitroglycerine 300 miles across the bumpy, twisting jungle roads to help squelch a runaway oil fire; the catch, of course, being that the slightest inappropriate jostle will cause the nitro to explode. 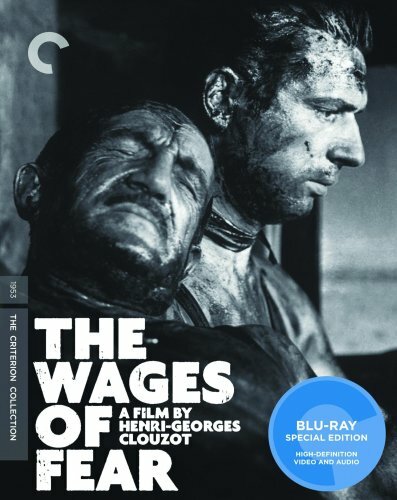 The Wages of Fear, all of these years later, remains for my money one of Clouzot's greatest works, a tense thriller piled high with diverse and colorful characters, some of whom reveal themselves in surprising and not necessarily admirable ways. Montand's Mario is a strange lead, a real what's-in-it-for-me type who isn't against slapping women and humiliating them publicly, even getting sultry cantina maid Linda (Vera Clouzot) to crawl across the floor like a dog. And he's Clouzot's hero. There's also Charles Vanel as Jo, a mysterious blowhard who drops into Las Piedras and befriends Mario, strutting around with gun-toting bravado as if he owns the town; it's not until the dangerous journey is underway that Jo's true colors get unfurled, and kudos to Vanel on a performance that truly evolves into one of sweeping pity and shame. Folco Lulli's jovial Luigi is almost the film's comic relief�all brawn and smiles�paired on the drive with bleached-blond Peter Van Eyck as the stoic Bimba, a man of few words who gets centerstage during one of the most suspenseful sequences in the film, involving what to do with a large boulder that is blocking the road. Aside from the always smiling Luigi (marred by a job-related affliction that will kill him unless he finds other work) and the unabashed low-cut sexiness of Linda (who seems to have no self-esteem and is happy as the town punching bag) there is little to find that is remotely positive here. Everyone and everything is flawed in some tragic way, and it is only the lure of money that keeps it all bound together in a tight little suspenseful ball, something that Clouzot mines expertly. The film is a masterful nail-biter once the journey begins, with bumpy roads and dilapidated wooden bridges, and a veil of despair that hangs in the air that is unrelenting. For this BD release, the original cut of the film has been issued in its original 1.33:1 aspect ratio, via an AVC-encoded 1080p transfer, and one only has to look at the fuzzy and soft film clips used in some of the disc's supplemental features to realize how spot-on striking this transfer is. First of all, the print has been neatly scrubbed of any debris, nicks or scratches to nearly pristine levels; aside from a couple of sequences (such as noticeable edge softness during Mario's first scene with Luigi) the end result is a sharp, detail-rich product where small elements such as beads of sweat and tiny smudges of dirt are clear; grayscale is first rate, with healthy, dark blacks, as well. The disc's sole audio track is an uncompressed PCM 1.0 mix, presented in French (though occasionally English and Spanish is spoken), with optional English subtitles. The restoration is an impressive one, and the lack of any hiss or crackle on a film this old is one thing to praise, but really it's the clarity and timbre of the spoken voices, as well as the near constant deep rumble of the explosives-laden trucks. The disc is packaged in a clear plastic case, which when opened reveals a striking two-panel shot (on the reverse of the cover art) of Mario and Jo during one of the film's big moments. The extras are the same found on the October 2005 Criterion release, beginning with a 14-page booklet is anchored by an article entitled No Exit, written by author Dennis Lehane (Shutter Island, Mystic River), in which he provides his own interpretation of the film and Clouzot's distinctive style. A pair of 1080i interviews shot in Paris in 2005 offer a couple of unique perspectives on the director's career, and feature one with Clouzot's assistant director�Courage and Clouzot: An Interview with Michel Romanoff (22m:36s) �and the second with author/Clouzot biographer Marc Godin�Framing the Human Soul (10m:09s). A November 1988 French television interview with Yves Montand (05m:00s), on the other hand, is basically a quick overview of his career and work on Le salaire de la peur. But for a truly in-depth look at Clouzot there's Henri-Georges Clouzot: The Enlightened Tyrant (52m:34s), presented in 1080i. This is really the jewel of the extras, a 2004 documentary culled from a more expansive French filmmaker series, and folks like Michel Romanoff, Suzy Delair and Brigitte Bardot contribute recollections amidst clips and photos from the director's catalog. And right up there in terms of rock solid educational content on par with The Enlightened Tyrant, is the 1080p feature Censored (12m:12s). Here we're given a history of the film's storied U.S. release in 1955, where 50 minutes of politically-motivated cuts were made, allegedly to remove anti-Americanism and some of the implied homosexuality. Even at just over twelve minutes, this is a fascinating look at the paranoid ugliness of domestic censorship.